How to unlock Sony Xperia Z3 by code ? Unlocking Sony Xperia Z3 by code is the easiest and fastest way to make your device network free. It doesn't interfere in your system or change it in any way so even after using our code, you don't loose your warranty. In order to receive a network unlock code for your Sony Xperia Z3 you need to provide IMEI number (15 digits unique number). It can be found by dialing *#06# as a phone number, as well as by checking in the phone settings of your device. Why unlock your Sony Xperia Z3 by code ? Because it is the easiest, fastest and most secure way of unlocking right now. There are a variety of services used for Sony Xperia Z3. Most popular is the SONY all networks service, which provides unlock codes for all networks from all over the world. If you know the exact network and counrty you might be interested in using a "specific service" for AT&T, T-Mobile etc. Even after using our code, you don't loose the warranty, the codes don't interfere in the system or change it in any way, so the producer doesn't have any rights to take away your warranty. The most important thing to check, before you make an order is the code counter status. Code counter that shows all 0 cannot be unlocked. 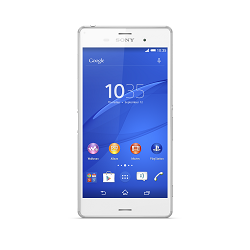 There are no tries left to enter the code to the Sony Xperia Z3. You are making an order at your own risk if you didn't check the code counter !! For unlock Sony Xperia Z3 following options are available. If you don't know which option use for unlock your phone, please contact us. We will help you choose the right product for your phone. Service worked as described. I was weary it may be a fake site as I didn’t see it on forums as much as other sites but took a chance as it was so cheap compared to other sites. Worked perfect, took less than 24 hours to get my code. Thank you and will use again if I ever need to unlock a phone. Quick service, worth not having to wait on hold with Bell. It was very good work. Full satisfaction. I recommend it. Unlocking instruction for Sony Xperia Z3 ? 7. If X is on NETWORK and value is different than zero, you can unlock your phone. Network unlock code or Sim pin network code is a special type of code which removes the network blockade from your Sony Xperia Z3. These messages will appear on the screen of your Sony Xperia Z3 when you insert an unaccepted simcard. Sony Xperia Z3 has a limited amount of unlocking attempts. Usually all Sony Xperia Z3 have 5 tries. If your Sony Xperia Z3 has a blocked code counter, there are no tries left, you cannot unlock this device by code. Important !!! Sony Xperia Z3 with a blocked code counter will still ask for a network unlock code. Even if you enter the correct code it won't work with a blocked code counter. The code counter can be reset only by an official Sony service. What is a Sony Xperia Z3 NSCK code? Sony Xperia Z3 needs different types of unlock codes to remove the network blockade. One of these codes is a NSCK code which is used in most Japanese networks like Docomo, Softbank etc. Those networks cannot be unlocked with the standard NCK code. Sony Xperia Z3 usually asks for this code as soon as you insert an unaccepted simcard ( from a different network ). In my case, it took about two weeks before the unlock code was issued. I was worried but the unlock code arrived without problems. I was able to unlock it well. It's a great system. Wszystko w porz±dku, kod dzia³a, szybko i sprawnie. POLECAM, wszystko szybko i sprawnie. Bezproblemowa bardzo szybka us³uga, polecam. I was able to unlock without any problems. Thank you. Super i kod pasowa³ siê. Posz³o b³yskawicznie i przy okazji bardzo mi³a i pomocna obs³uga serwisu. Wszystko szybko, sprawnie i co najwa¿niejsze dzia³a. Ponad 50,- w kieszeni i przynajmniej h do przodu. Mo¿na by tylko poprawiæ instrukcjê np o zdjêcie. Za pierwszym razem po wpisaniu pinu nie przesz³o do funkcji kodu odblokowuj±cego (a mia³em tylko dwie mo¿liwe próby). Spoko 2 minuty i po sprawie .Sony Xperia z Orange. Dziêkujê za ekspresow± realizacjê zamówienia.Bardzo dobry kontakt z doradc±, a co najwa¿niejsze kod zadzia³a³ :) telefon odblokowany. wszystko szybko i sprawnie. Kod zadzia³a³ bez ¿adnego problemu. Szybko sprawnie, korzystam z tej us³ugi ju¿ nie pierwszy raz... Wczoraj by³o ¶wiêto i mimo wszystko kod otrzyma³em na maila szybciej ni¿ uda³o mi siê wykonaæ przelew za us³ugê... Kody dzia³aj± w 100% pod warunkiem, ¿e nikt nic wcze¶niej nie kombinowa³ z telefonem na w³asna rêkê i nie zablokowa³ licznika.